The Nats went ahead and went crazy today, signing Max Scherzer to a seven year deal. They now have the best rotation perhaps in the history of baseball – heck, they’ve got enough guys to populate two rotations with their top three pitchers. But will it last? Starting with the Scherzer deal, he’s been a stellar pitcher for three seasons, and despite some early career bumps, there’s no reason to think he won’t continue. He was always a top prospect (picked 11th overall) and while it took him a while to figure it all out, once he did, he’s been a true ace. All the caveats of signing 30 year olds to long term deals apply here, and we don’t know what he’ll look like at age 36, but if they can get three great seasons out of him and two very good ones, that’s a really good acquisition. What this does do, though, is probably prevent them from signing another 30 year old to a seven year deal – that being, of course, Jordan Zimmermann next year. If this is an either/or decision, then it’s interesting to see how these two guys compare. So I figured what better way to compare them than with the magic and beauty of charts. 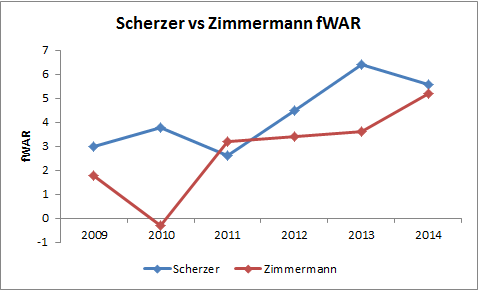 In terms of overall value, Scherzer (a year older) has been better the last three years than Zimmermann. But with Zimmermann, you know what you’re gonna get. If 2014 was just an exceptional year for him (which I think is a safe bet) and he returns to form, he’s still a great pitcher. Scherzer has some more volatility there, so he’s less predictable. The two are really close over the last few years, and while Scherzer is projected a bit better, it’s safe to say it could go either way. The deciding factor, though, would be the change in leagues. Scherzer has been doing this in the tougher league, and in a hitters park, so it’s likely his ERA will go down with the move to the NL. They’re pretty tight in ERA, so I won’t say one is clearly better than the other, although league and park effects give Scherzer an edge. But in terms of strikeouts, there is definitely a clear winner. 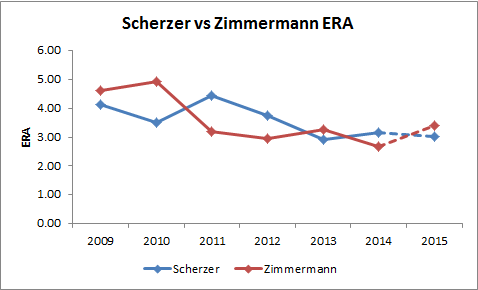 Now, JZimm is a control pitcher that likes to hit his spots and doesn’t mind giving up a ground ball or two, whereas Scherzer is one of the top strikeout guys in the league. 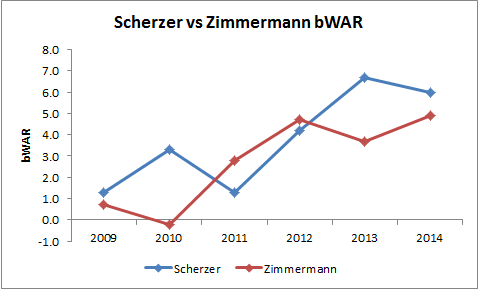 JZimm’s numbers certainly went up in 2014, but again, if that’s an exceptional year, than the difference will be bigger again. One more for good measure, let’s take a look at FIP, a measure of what their ERA should look like (that is, adjusting for league average BABIP and the like). This one actually surprised me a bit. 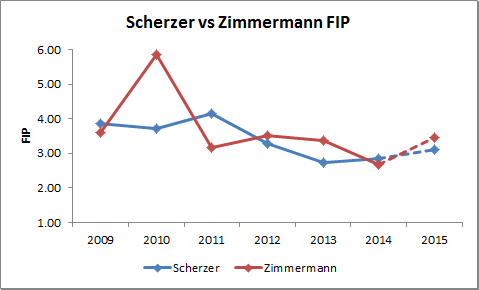 With Scherzer’s great K rate, I thought it would yield a more impressive FIP than Zimmermann. What is shows is that JZimm isn’t succeeding through things that are considered flukey – he doesn’t strike out as many guys, but other factors in his peripherals help make him great. That being said, FIP isn’t league or park adjusted, either. So Scherzer is pitching in the tougher league and in a hitter’s Park. On it’s own, the FIP looks a tad better, with those factors, he certainly looks better. He’s a definite ace, and an ace without a worrisome injury history. You already know him for his strikeouts, but he really excels in one area in particular. If you’re chasing against Max Scherzer, you know you’re in trouble, but if you’re not chasing, you might still be in trouble. It’s Scherzer, then a guy with a trick pitch, then a decent gap until the next regular arm. Scherzer finished second in baseball in 2012, behind Dickey. He finished first in 2013. And he finished second in 2014, behind Dickey. Scherzer doesn’t need for hitters to flail away to succeed — he’s strong enough with strikes, and he throws a lot of strikes. Whatever the reason, you can expect to see a ton of strikeouts at Nats Park this year, as Scherzer ranked 3rd in MLB in K rate, and Stephen Strasburg ranked 5th. Gio Gonzalez, by the way, ranked 13th, when you include guys with 150+ innings. If considering between which one of these guys to sign long term, there are advantages and disadvantages to both. Scherzer has had better results over the last few years, and that should continue with the move in leagues and parks. Scherzer is one of the best strikeout guys in the league. Extension talk with JZimm seems to have fizzled out, so they’d probably have to wait until the end of the season to get him to sign. That probably means signing him at the same age. 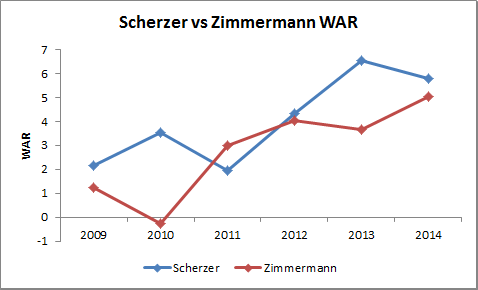 But Zimmermann is less volatile than Scherzer – just as his numbers suggest he’s not as likely to have a Cy Young season, he’s seems likely to keep doing what he’s doing. A predictable #2 is a great thing to have, and he will have plenty of suitors. I also think that his control, with one of the lowest walk rates in the league, might help him if he loses a tick on his fastball. Scherzer has a better K/BB rate, but it’s on the back of a great K rate coupled with an average B rate. 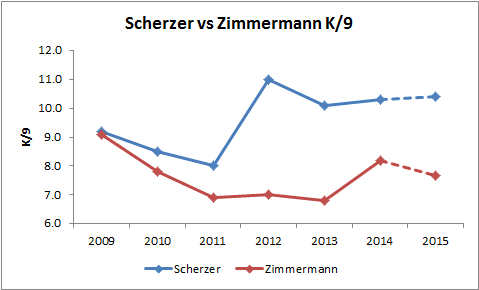 There is one thing about Zimmermann that scares me much more than Scherzer, though, and it’s that he’s already had one Tommy John surgery. I wonder if there might be a useful life to that ligament. That is to say, not everyone needs it, but what are the chances that someone needs it twice? I am not sure of the answer to this, but I know that Scherzer hasn’t had the surgery, and Zimmermann has. By the time next year ends, JZimm will have thrown 1000 IP since his surgery, barring other injuries. Are some pitchers just made to put stress on that ligament and need to get it replaced while others aren’t? I don’t know, but nobody else does either. In that Jayson Stark article he mentions the guys who need it soon after the first surgery as the main concern. Ok, but for JZimm, it’s that group who needs it “after a long period of post-operative success.” Nobody really knows what will happen, but if we find out down the road that having TJ surgery once means that after 1,000 IP or 1,500 or whatever, there’s a strong chance a guy will need another – that would not bode well for whoever signs JZimm. As for Scherzer, he’s never had the surgery, and he’s thrown over 1,400 professional innings. Does that mean it’s likely he’ll never need it? I’m guessing yes, but again, we don’t really know. The Nats are certainly better after acquiring Scherzer, but they’re not that much better. Let’s say, for the sake of example (and not to start an argument, please don’t start an argument) that the Nats slot Scherzer in as their #2 guy behind Strasburg. Their rotation of Stras-Scherzer-JZimm-Fister-Gio would have been a few wins better than Stras-JZimm-Fister-Gio-Roark over the course of the year, in terms of WAR. It doesn’t make them a 110 win team. If Roark was terrible last year, maybe, but he was a 5 WAR player. And if they wanted to replace Gio, even he was a 2.3 WAR guy, lower in part because he didn’t quite hit 160 innings. As far as getting to the playoffs, barring major injuries, this doesn’t do a whole lot for them. In the playoffs, yes, the more aces the better. But they certainly didn’t lose the 2014 NLDS because of bad pitching. So they could play the season with the best starting five ever, hands down, or they could go into the season without one of them, and still have an argument for the best starting five ever. That’s why I assume a trade will be made. It just doesn’t make a ton of sense to have, essentially, the best starting six. And when you think about the fact that A.J. Cole could be ready… it’s an embarrassment of riches, for sure, and it might be best to move those gold coins to another pile. While acquiring another middle infielder, especially if Desmond is on the block, is my first reaction, I’m not even sure if that’s necessary. Going back to those STEAMER predictions – they have the Nats as the third best OFFENSE in the majors, best in the NL. So they’ve got what they need there, although health and the lack of a true superstar in terms of production (could be Bryce this year?) makes it a great sum of parts and a different animal than the pitching staff. They presence of Cole, and Giolito, make a long term deal for Scherzer also a little bit of a curious move. But, as pointed out to me on twitter, it might not be that crazy. The Nats might have wanted one pitcher on a long term deal, and just didn’t see JZimm as feasible (because of what he wants), Fister as what they wanted and Strasburg as knowable. If they can’t re-sign Zimmermann, don’t want to re-sign Fister, and see Strasburg as too far off and too uncertain to know right now, well, they went and got their guy a year earlier than we all thought. That makes quite a bit of sense. The Nats are a better team for 2015, at least marginally. They also signed a perennial Cy Young candidate, so they should be better in the playoffs. He may not be the same guy by the end of contract, and long term deals like this are always scary. But they should get some great years out of him. I don’t expect this to be the last move of the offseason. Today is a big day for the franchise, and I’m excited to see what is gonna happen next. Meanwhile, Max Scherzer does not, according to Baseball Reference, have a nickname. But the whole eye color thing is hard to ignore, and since David Bowie has the same (or similar) condition, I think it’s only fair to steal a Bowie persona. So… Major Tom, the Spaceman, the Thin White Duke, Aladdin Sane and Ziggy Stardust are all fair game to help develop Scherzer’s nickname. Have at it. Edit: After I posted this, more details of his contract came out. It is significant news because just how much of it was deferred, leading to savings of probably over $30 M on the net present value of the $210 M of the total value. It also gives them flexibility to make future free agent signings that a $30 M per year deal would not. It adds to the Nats case of why they would make this deal. For details on the net present value of the contract, check this post out.